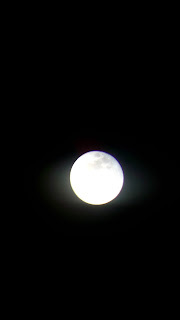 I took over 30 photos of the Supermoon on January 31st using the Tudor Telescope and my Moto 3 smartphone to capture the images. Whilst reviewing the images I found this one which was by far and away the best. 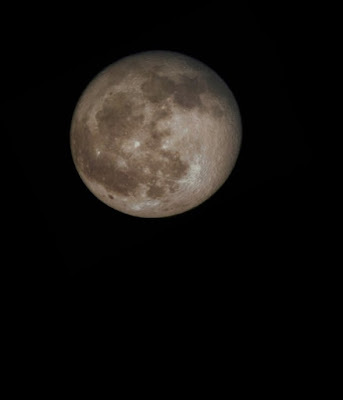 There is a little spherical distortion which makes the Moon look slightly egg shaped but the overall image is very sharp and shows what could have been achieved in Shakespeare's lifetime. Several craters can be seen and the lunar surface looks textured and contoured and not smooth and perfect as the celestial realms were thought to be at the time. However, this photo is the exception. Most of the images I captured looked like the one below and showed little or no details of the lunar surface. I am reminded of Shakespeare's Richard II and the famous lines about perspectives when viewed awry showing nothing but confusion. Get the right combination of light and angle and with persistence it is possible to capture a good image of the Moon using the Tudor Telescope. Get the angle wrong and the results are as meagre as Horace's quote about mountains giving birth to a mouse.